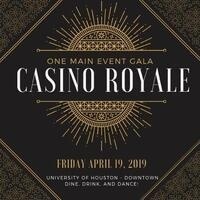 The One Main Event Gala is an annual awards ceremony hosted by Student Activities and recognizes organizations and individuals whose contributions to the University of Houston - Downtown make student life amazing and create positive change. Award nominations are submitted and highlight those students, faculty, staff, and organizations who have showed tremendous commitment, character, and hard work throughout this academic school year. This year’s theme is “Casino Royale” and will feature grand décor and sophisticated ambience as we celebrate the highest form of excellence and achievement.